Haven't been this way for a while, but amazed to find the place boarded up. Have to agree with other posters on here this is an above average JDW. In here early last Saturday morning and quite busy but service was fine. Guest ales were from £1.99 a pint. A very decent 'spoons in my opinion. Came in here after the Wat Tyler and found the place to be much better, brighter and a bit more cheerful, though the Wat Tyler was friendly. A couple of decent guest ales on and the pint from the Kent Brewery I had was very good. Very busy on a Tuesday night but the place has a nice feel and is one of the better 'spoons I have visited recently. Staff were quick and attentive, tables were clean and the beer was good. 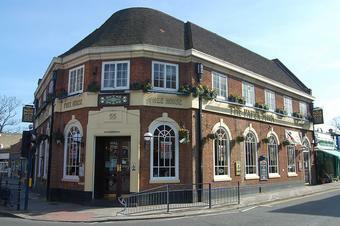 Wife and I have started frequenting this Wetherspoons as the other one in Dartford (Flying Boat) started going downhill after a few months of opening. Staff in the Paper Moon are friendly and service is always quick. Cannot fault the 'curry and pint' for �4.59 on a Thursday night!! Out of the 2 wetherspoons in Dartford this would always be my second choice. It is just not as clean looking and fresh as the newly opened Flying boat although the staff were friendly and the food is always of a good standard.